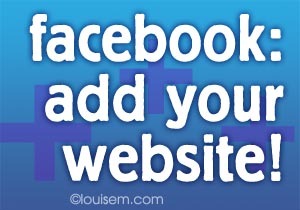 Here’s a great FREE and easy tip for Facebook Fan Page Tabs: Add Your Website to Facebook. Designers and developers the world over won’t like that I’m sharing this simple secret with you – they’d rather you think that you need their help to do this. But – you don’t! You can add your web page yourself in minutes. Follow these step-by step directions to add your website to your Facebook Fan Page! Logged into your personal Facebook account, install the Static iFrame Tab App by clicking this link. Once on that page, click the green box: Install Page Tab. This will take you to the Add Page Tab box. Here, choose the Facebook Fan Page where you wish to add a Tab, and click the blue box: Add Page Tab. This will take you to Tab Settings on your Page. At Page Source, select URL, and enter the URL of the web page you want to add: your blog, webinar signup page, email optin, etc! The website is fully functional inside the frame in Facebook. If desired, you can adjust the height so the frame doesn’t have the scroll bar on the right. This may take some tweaking back and forth to get the right results. Skip “Gating” and the tiny tab icon, and scroll down to Name your Tab. Below this you can Change Tab Image – check this post for how to create Custom Tab Images. Now click the green box: Save Settings. Click the gray button at the top, View Tab, to check out your work. If you wish to make changes, just click on the small blue word Settings at the top right of your tab. Facebook Tabs are now 810 pixels wide, and while that’s 60% wider than pre-Timeline, it’s not as wide as most websites. If your website design includes a right sidebar, viewers will easily see the majority of your page (as shown below – click it to see the full tab live on my Page). But they’ll have to go all the way to the bottom of the frame for the left-right scrollbar to view the right-hand side of your site. If you prefer, check these directions to use a Facebook app to send Fans offsite to your website. Sit back and admire your creation – your Facebook Fan Page Tabs show off your website! This will be more cool n useful for the business here! thank you for posting here! Thanks for your comment Sam, best of luck with your Facebook Fan Page tabs! I followed the instructions however I was not able to get the pinterest tab view to look at good as Yoga Relief who did a very nice job. Hi Kay! On Yoga Relief’s Facebook page tab ( https://www.facebook.com/YogaRelief/app_208195102528120 ) we’re just showing ONE board, instead of the main page of all the boards, which I agree, does look nicer! Just grab the URL of the specific board to get this effect. And you can always add more separate boards as separate tabs. You can have up to 12 tabs total – this includes your Photos tab, Videos, Notes etc if you use them. Thanks for your comment! I just tried this and it works really well. I wanted to add a second tab to my page however was not able to – is there a way to do so? Great question! You absolutely should be able to do that by clicking the same link in the article, and instead of clicking the green rectangle, look to the very bottom of the gray box where it says: Need more than one tab? Are you logged in as the Page? You need to be logged in as your personal account. If it’s not that, could you explain what you mean by “takes me away from the FB page” and I’ll try to help! Hi, I’m trying to upload an image for my welcome tab but says it’s too large, but the image is 800px x 1100px which is smaller than the requirements???? I’ve tried resizing it smaller, but it will only accept it when it’s teeny tiny and then you can’t even read it. Hi Latonya! There’s a maximum file size – not the dimensions, but it can only be 400KB or smaller file size. If it’s larger than that, can you compress it (in your photo editing software or even at pixlr.com)? If it’s not larger than that, try again tomorrow because Facebook has had a number of weird bugs with the changeover to Timeline. I hope it works for you! Thanks so much for this post and the one on how to make a tab image. I was successful adding my first tab, but now when I hit the link the drop down arrow where it says, “Choose your Facebook Pages” it no longer shows the page I was working on as a choice, which of course leaves me at a dead end. Any idea how to fix it? Need more than one tab? If you’re already doing that, let me know and I’ll look into it further. Good luck Rachel! Yes! Thank you so much…worked perfectly. I don’t know how I missed that. I am going to recommend your article to all of my teacher blogger friends! Yay! Glad it worked. Thank you for recommending my article! Just the thing I have been searching for Louise. Easy when you know how! I thought there had to be an app that made it easy without too much technical stuff. I too had trouble trying to add a second tab but have seen your answer above. I’m so glad you found this easy Facebook tutorial helpful, Sandy! Thanks for your comment. This is awesome! How do I increase the width of the iframe? When logged in as an admin, go to your tab and click the blue word Settings in the upper right. The very first item in Settings is Enable Timeline 810px Wide Mode. You can also see this in the third image in the tutorial above. I tried this out and the only issue I have is that once I’m done if I try to view the contents of the tab, I get a “coming soon” message. Does it take a while before the page appears? If the tab you added was “Our Brands,” I do see it now. FB continues to have bizarre glitches – this is one I haven’t experienced yet! Thanks for your comment. I hope all the tabs you added did show up! The coming soon message appeared for me as well, but I was able to remove it by changing the preview mode to public, versus admin only. This setting is under Tab Settings at the very top of your iFrame editing page. You have posted a great helpful article. You don’t know how much I searched for this detail and finally I had to bought a small report on it. Still there was something missing. I am doing some of the works now and will come back to your article with some questions. Wonderful, Tina, I’m so glad you found what you needed here! I have this question: If someone has a FB account (old layout) and he wants to add me as admin, how can he do that? If he can somehow, then how can I go from there to upgrade his personal page to Timeline layout? (Its a personal page, not a business page). I know only by creating a page—but in that case, which category should I go? Personal profiles don’t have admins. As far as I know, only the person whose profile it is can make any changes (unless he wants you to log in as him – not recommended). Your friend can go to this page: https://www.facebook.com/about/timeline and click “Get it Now” to update to Timeline on his personal profile. I am tyring to create a Twitter tab for our users to follow us on Twitter but when I click on the tab nothing is showing. The URL to load in the iframe window doesn’t show. The pinterest tab works just fine. My guess is that it’s a secure site: https. I might have an idea for this that I’ll try out and post about if it works! I just wanted to thank you for the very helpful tutorial, this was exacty what I needed! You’re welcome Emma! Thanks for your kind comment. sunny greetings from Diani beach Louise, Thank you very much for this great post. I was just wondering if you could advise me how to upload the mobile version. I would give it a try how does it look like… Thank you very much! Hi! I don’t have the scoop on the mobile version. Hope you find that info so you can check it out! How do i solve this problem? Please kindly advise. thanks in advance! 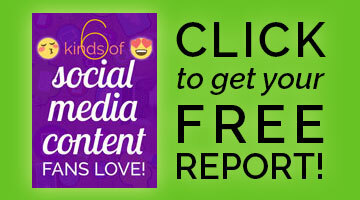 Are you logged into your FB personal page, and have full admin rights on a FB business page? If this is the case, I’ll have to do some troubleshooting. I’ve not heard of this problem before. I’ve solved the problem cos I was not aware that i need to create facebook pages for my fb timeline. Facebook no longer allows default landing pages, except when you run an ad. Otherwise, any visitors to your Fan Page will go directly to your Timeline. Tks so much!! Louise. Im new to Facebook. Need your help desperately cos I just want to create a facebook like eg. How do i go about setting something like the example above? Meaning anyone who know my business name will be directed automatically to this page and it will show all my custom tabs. Appreciate your reply. Have a good week! 🙂 You can drop me a mail too. Tks once again! Hi Sarah – that’s a great page. Very professional both in graphics and marketing. You can give people your FB fan page URL, but I don’t know what you mean by “directed automatically.” Depending on how unique your company name is, you may or may not be found on the first page of a Google search. To set up a page as attractive and effective as the one you showed me is a big undertaking. Good luck! You’re welcome – thanks for taking the time to leave such a nice comment! Thank you Helen! I love hearing that my post helped you set it up easily. Finally! An easy to follow, updated-for-Timeline, way to add custom tabs! 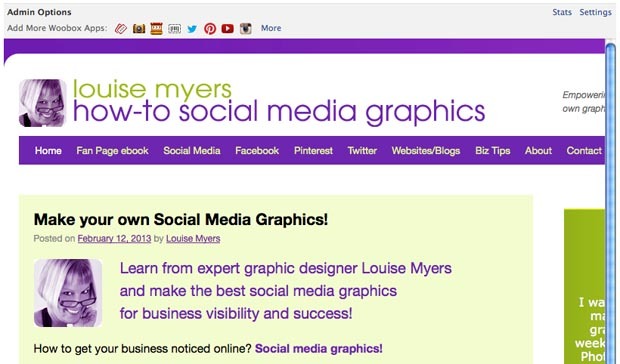 Thank you Louise – so glad I found your site and this page. and added a custom tab to link to my blog (thanks to your clear instructions). As you indicated, the blog opens up inside FB. Is there a way, however, for the blog to open up *outside* the framework of FB? In other words, the person clicks on the tab and they go directly to my blog, leaving FB? Try this: under Page Source, click the Redirect button and put in your blog URL. That should work! Also be sure to put your blog URL at the beginning of your About description. That did the trick – thank you so much! your article seems like it’s exactly what I’ve been looking for! But I’m having a problem right at the start. So I don’t understand why it doesn’t let me install a new app, even though I think I have all the admin permissions I need. Maybe there’s something in the Settings that I have to change? Thank you soo much for all the help! You shouldn’t have a problem if you’re logged in as your personal profile and you’re an Admin. You do need to be logged in as a person and not a page though. If it won’t let you when you’re logged in as yourself, then your Admin role doesn’t have the necessary privileges. Aaah, I get it now! And it’s working! Thank you for your help!! That would be great – thanks Fiona! Great article. Nicely explained and simple to follow. You mention at the end that you can change the tab so it’s redirected to a mobile version of a landing page. But I can not see where to do this. Can this only be done through first signing on with Woobox or is there a simple way for me to do it? I would like to have a testimonial tab. I am thinking the best way to do that is to link it to the testimonial tab on my website. But of course the website doesnt fit in the frame work. So I am thinking the mobile version would show better. You would enter the URL of the mobile version of your website, if you have one. For instance Facebook and Pinterest each have mobile versions that start with “m.” – i.e. m.facebook.com. If you don’t know the URL, you could check your site on mobile, or ask your web designer. My sites don’t have a separate mobile version. Thank you! This is awesome! I remember a while back I tried to add a tab to Facebook with specialized html and it did not work so well. I never could figure out what went wrong with it. The only thing that freaked me out was that my page disappeared for a couple of minutes. But it showed up again. You’re welcome Rick! Thanks for your comment. I was looking for how to do this for hours and became extremely frustrated at the complexity of other options that I found. Thanks so much for the post. Now, if I could only change the long url to something smaller. Hey Carl, you can easily shorten the URLs by using bit.ly. Thanks so much for the helpful post! I was able to create a custom tab to display a webpage I created on Google Sites. However I would like to only display the actual content of the page itself. I was able to take out the scroll bars by increasing the width, but how do I decrease the length so the additional google site info won’t be visible? Thank you for your help! This technique embeds the full web page. I don’t think there’s any way to eliminate the footers or any other part of the page. Thank you so much for sharing this! This is exactly what I’ve been looking for! Thanks Amanda, I’m glad you found it useful! Thank you so much for your tutorial! It’s very helpful. I’ve managed to create one tab, but noticed that when using the mobile version of Facebook (from my iPhone), the tab doesn’t show up on my page. Have I done something wrong in the setup? Everyone’s using the mobile Facebook app nowadays….how can I make sure the promo tabs show up on the mobile version too? Thanks! Tina, I’m sorry to say I don’t know the answer to your question. I’m not totally familiar with the differences between the desktop and mobile versions of Facebook – and they’re changing all the time! I’m afraid you’ll have to contact Facebook support. I hope they help you sort it out. Thank you, It worked like a charm on one of my fanpages (completely “fresh” fanpage). But I have a problem trying to install in on fanpage where i already had iframe tab installed (for external url redirect). If I repeat (your) steps I always end up with installing old (ext. url redirect) iframe, I don’t get to tab settings step. Help please. Thanks! Haven’t heard of this problem, sorry. Perhaps a different browser or clearing the cache? In FF didn’t work (I cleared the cache), using google Chrome did the trick (it opened option for 2nd iframe tab to be installed). Strange. Anyway, thanks for help. How interesting! Thanks for letting me know what worked. Thanks for a great article. I have just followed your instructions and now my FB page is much more functional. Terrific Norman! Thanks for your comment – glad to hear it helped. Thank you for sharing this article – have found it very useful! I don’t know if that’s possible, however – if anyone knows it would be Mari Smith and her team. You can pose this question on her FB page at https://www.facebook.com/MariSmith. ok I thought this would be perfect and just what I needed for my job to add an extra tab with ease. I have the same issue someone else had about a year ago on here. “coming soon”. I can see the tab just fine logged in as me. When I log in as my wife……”Coming Soon”. I created this yesterday, so now 24 hours later still “coming soon”? What gives and then does this mean any time I make a simple change to the tab it’s going to take half a week to be updated for users to see? To me, this renders this third party tool useless. Not to mention, I think woobox’s customer service and options to reach them is crap (at best). The most I find is an email address and you know how that works these days. Needless to say, the integration was simple, but functionality is still a mess. That said, any ideas on how to view the contents of my tab where everyone else sees “coming soon”……? Hi Billy, sorry I don’t know how to resolve this! I can look into it and see if I find anything. I’m also sorry to hear that Woobox’s support is lacking – I’ve found them helpful in the past. Let me know if you find a solution, and I’ll do the same! Best of luck! Thanks ,you just saved me 20 $ . I saved the 50 Polish PLN. Thanks. Thanks for a great and very useful article. I tested the iframe webpage import & it works! Just a doubt – is it possible to have a horizontal scroller so that the webpage width is not truncated to 810px by facebook? Once again, thanks! Depending on the height of your iFrame, it may not be apparent, but it should be at the bottom of the frame. Be sure you haven’t clicked “Hide Scrollbars” below the URL entry on the settings page. Let me know if this works, as the app may have changed since I did this tutorial! seems to work as described above, but every time i test it, the site is not stayin within the FB page, it is opening up in the actual website, which is ok, but would prefer user did not then have to go back to fb..
Make sure as “Page Source” you’ve selected URL and not Redirect, which will take them off Facebook. I hope this resolves it for you! I wasn’t aware of Woobox before reading this post. With your help I was able to add a new tab for YouTube and Twitter very easily. Awesome to hear that, Graham! Great to hear, Ravikumar. Thanks for your comment! Glad to hear this helped, Lianny! Thank you so much! I just added the Pinterest app to my Facebook page as well as my website. Your instructions were so clear and easy – wonderful! Thank you!! I must be an idiot as I seem to be the only person who cannot get this to work. Add More Woobox Apps: Sweepstakes & Giveaways Photo Contests Instant Win Giveaways Coupons & Vouchers Twitter Tab Pinterest Tab YouTube Tab Instagram Tab More” and no sign of my website. Looks like they added an ad in there. Just click the word Settings and you should see Page Source and the rest. Let me know if this does or doesn’t work – then I’ll be sure to update the post! I want to show some particular part of my web page content instead displaying my full web page. How to I control it? If you know HTML, just choose that option instead of URL. Paste in the code for what you want to show. I want to show my webpage it is a dynamic webpage (in Asp .net) and it uses database to store form content and redirecting to another page after completion of the form submittion page. It is possible to show dynamic webapge if it built by .net, jQuery and ajax? I don’t know, but why not give it a try? It really takes just a few minutes to set this up. Sorry I couldn’t be more helpful. You could ask support@woobox.com, or Facebook, if you don’t want to try it first. When I embed my website, it won’t let me navigate past the first page. If I click on something, I go to whitespace. A year or more ago, Facebook switched to only allow https sites to be embedded. While it doesn’t explain why the first page loads, it could have something to do with it. Or, they just stopped supporting this feature! I’ll make a note in the article. Thanks for the heads up. Your site has been terrific support for me the last two days in updating my fan pages. The last message answered one of my questions. I was getting the same white space for other blog tabs when selected when my blog is embedded into the fan page. So that begs the question as to whether it’s better to just do a redirect? Also, I found that the text in the slider at the top is all blackened. When I tried the redirect, I could not find a way to let the FB user know that they were leaving FB. How do I do that? Thanks for all your help. Going to try a few more things. Please report back if you come up with anything! Hmph…for some reason this isn’t working for me.. I have been looking for this info for DAYS. I installed a tab on a Facebook page years ago and couldn’t locate the information on how I did it! Thank goodness I found this. I used the iFrame Tab setup and it works wonderfully. Fantastic, Geri! So glad it helped. Thanks for your comment! Not sure what’s going on with this. Doesn’t seem to work any more. Sorry! I’ll update if I get any current info. I added a tab in my facebook page having the link of my webform. All went fine but as I click on the button on my webform, The website vanishes. You would need to get in touch with whoever supplied the tab app. So if it’s Woobox, their support department should be able to help you.